Jarvis Christian baseball team has added another name in a list of those who will continue their baseball careers at the professional level in 2017. 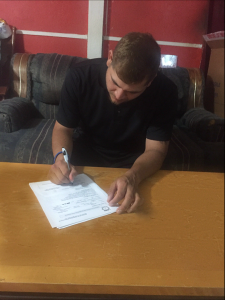 After graduation last week, Carlos Andrade, a 5-11 first basemen, signed a contract to play for Rieleros de Aguascaliente, a professional baseball club in the Mexican Professional Baseball league. With Andrade’s signing, he joins former teammates Elon Chamberlain, Javion Randle and Angel Merced as those who have signed professional contracts to play in 2017. Rieleros de Aguascaliente is a professional baseball team located in Aguascalientes, Ags. Mexico. Andrade, a native of Pasadena, Texas, played in 60 games for the Bulldogs this past season and had a .354 batting average with 12 home runs and 63 runs batted in. He was a four year starter for head coach Michael Holochuck at Jarvis Chriatian and a Black College Nines HBCU Baseball First Team Elite selection. “Man this year has been amazing an just God blessing me and allowing myself to continue to play the game still and also finishing college this year. Today signing to play for Rieleros de Aguascalientes.” Upon his signing, Andrade will begin playing immediately.